Mention has been made a number of times to the character of openings in walls. Essentially, windows usually have to provide light to illuminate rooms, air to move in and out of them and, under certain conditions, to allow views to be obtained from within the room. Though this was the case from many of the first floor rooms in the old buildings at Al Wakrah, the need for privacy made this feature less of a requirement, certainly for ground floor rooms. Windows were nearly always at low levels though ventilating openings were often provided at a higher level to vent the hot air from a room. This row of windows in an old ruined building is typical in their size and positioning of those in many of the old buildings, particularly majaalis which are usually characterised by the open character of their walls. These windows illustrate the basic design of old windows. Conceptual security problems saw the use of wrought iron bars to protect the windows. Due to their slenderness the iron bars often had a central horizontal timber frame to strengthen them. Although they look frail, the fact that they are wrought iron makes them much tougher than they appear. The frames were made of relatively small sections of timber, generally teak as in this case, and usually nailed back into the wall to fix them. As there was an obvious problem with fixing frames securely, the vertical elements of the frame were taken down into the wall construction, about 150mm below cill level as can be seen in the illustration below. You can see in the photograph above another feature of almost all windows, and this is the horizontal timber frame near the top of the window, providing a horizontal gap of around 100mm clear. In this case there are three vertical timbers sub-dividing this part of the window frame, coinciding with every other vertical wrought iron bar. As far as I can make out by observation, this horizontal gap provides light and air when internal vertical shutters are used, these being an additional security precaution as well as providing a degree of environmental protection. Having said that, in buildings which were developed more recently, this feature often has glass inserted, providing light to the interior when the shutters are closed, but preventing the relatively large air flow which would enter through the gap. There would still be a degree of air movement around the shutters as they are not fitted with a great deal of accuracy. Curiously, this feature can also be seen above doors as in this old doorway in the centre of Doha where it makes obvious sense to encourage ventilation into a space which links the central courtyard with the sikka outside. But, here in the middle of the desert, is the head of a door leading directly into the enclosed courtyard where you would not anticipate there being a problem with ventilation. It is too high to act as a window, the wrong character for a spy hole, and has little function aesthetically – yet it is not unattractive and I wonder if this was its purpose. Notice that both this opening and that in the photograph below, are protected by wrought iron bars rather than being of timber as are the openings above the windows. Although this first illustration is small, it gives an indication of the manner in which windows were located and some of the issues that had to be dealt with in their design and construction. With the development of the formal majlis within the courtyard, windows were usually provided only to the outside world protected both by vertical wrought iron bars, hadid ash shubeck and with internally opening wooden shutters, dhafaqat. The shutters usually incorporated a decorative ’enf, similar to but smaller than that of the main door and with only a small amount of carving, perhaps due to their size. The lower sketch illustrates the manner in which the shutter closed against the window leaving the top of the window open, allowing ventilation. Windows were recognised to present an obvious potential source of weakness, so it was the custom to construct the window frame with vertical legs projecting 100-150mm lower than the bottom horizontal window frame, and to embed these in the stone and juss construction of the wall opening structure. This was carried out before the final juss finish was applied. I don’t recall how the fixings were made to the vertical elements of the window frame to the wall, but believe them to have been nailed through with wrought iron nails into the wall. This part of the construction was obviously potentially weak as the frame and its hadid ash shubeck would have given a strong purchase to anybody attempting to remove them by pulling them out. Traditionally, window cills were located relatively near the floor, usually at between 150mm and 300mm. The reason for this was that it was the custom of the inhabitants to sit on the floor as they met and talked over the matters of the day. There was also a functional requirement to have at least a small upstand in order to have a setting for the dowaashek and masaanid on which which people respectively sat on and reclined against. Views out would normally be obtained by sitting at that level as the head of the windows is always well below the normal eye level of a man standing. Even when glass became more readily available, houseowners rarely incorporated it as the windows’ main rationale was to permit ventilation. Having said that it was also the custom to have a wooden shutter inside the iron bars, providing a certain degree of security and privacy. In the more developed houses it is sometimes possible to see a small overpanel of coloured glasses set in a teak frame within the overall window opening. Before looking at the subject of doors a little further down the page, it may be sensible first to consider the treatment of entrances to larger sites where there is often an element of ostentation, an issue that was inimical to much of the traditional architecture of the peninsula. This first photograph illustrates one of the simplest entrances found in the peninsula, and belongs to an old fort in Rayyan. It is austere and functional as you might anticipate, with no other protection other than that afforded by a corner tower out of photograph on the left. Compared with the foregoing this photograph illustrates a later and more formal approach to the design of entrances, and is the south entrance to the Diwan al-Amiri in Doha. It reflects its rôle as an element of the seat of government. Not visible here, the farkhat al bab was contained within the left hand leaf of the pair of wooden doors securing this gateway. As there was still a defensive rationale to this entrance, the position has been strengthened by a pair of projections of the wall adjacent to the entrance. A more developed, but earlier entrance was that in the fort at Rayyan, seen here photographed in March 1972. Compared with the fort in the first photograph in this section, this was a base for both military and police and was located centrally to protect the Rayyan area where many members of the Royal family had made their homes. In this respect it was similar in function to the fort at Rumaillah to the west of Doha. Note the depth of the entrance which contains adjacent rooms behind the doors allowing additional surveillance and protection. Many of the entrances to the properties of important merchants and members of the Royal family were treated in a relatively undecorated manner, but there were a number of exceptions to this. Unfortunately I don’t have many examples, but the following group of photographs suggest something of their character. They are not shown in any particular order, and their juxtaposition is purely coincidental. This first pair of photographs show relatively simple entrances, both of them in Doha. They illustrate two different types of entrance. On the left each of the two entrances has a pair of doors, one of them having a farkhat al bab, with external porches attached to the peripheral property wall. Incorporated into each side of them was a simple dikka used by guards and enabling those passing or entering the compound to enjoy conversations. It is not an entrance that permitted easy vehicular access. The entrance illustrated on the right is more unusual in that it is incorporated into the main building with its majlis on one side. There was a dikka on both sides of the external approach as well as inside the entrance. The photograph on the left shows the east-facing entrance to a palace on the Rayyan Road. There is no dikka built in, the gatekeeper having to sit outside on a folding metal chair. Vehicles were easily able to gain access to the site, with the majlis being inside to the right. In its style, the entrance bears obvious detailing and massing from the Indian sub-continent. I am unable to recall where the photograph on the right was taken, but it shows similarities round its windows with some of the villas constructed in the Rumaillah area. The grille over the doors has a direct relationship with those over many of the doors in smaller residential compounds, some of which are illustrated below. There are crescent moons with eight-pointed stars above the doors, and five-pointed stars on the top corners. In addition there are a pair of stylised palm trees suggesting, perhaps, a Saudi influence. These two fanciful entrances are interesting in that they are extremely extravagant in both their scale and detailing, neither of them being characteristic of traditional domestic architecture of the peninsula. That on the left is decorated asymmetrically with some elements taken from classical Western design, but with three-dimensional roses applied both to the façade as well as to the capitals of the columns. The top of the structure pays lip service to some of the detailing of the tops of defensive walls. Compared with that, the top entrance decoration in the right-hand photograph has two large fishes supporting a central motif based on a five-pointed star, while the façade is lightly moulded and painted with large scale stylised plants. There is an Art Deco feel to some of the detailing but the element over the gateway is oppressive. Again, there is no dikka, but metal chairs are provided for the gatekeeper or guards, and the entrance is a working entrance to the property and its majlis. Like many of the entrance designs of this period, the private entrance on the left shows the influence of both the architectural and pastel colour palate of the Indian sub-continent. It is likely to have been designed by an architect or draftsman from that region. This character of design influence can be seen in many of the buildings of the 20th century in Doha, particularly from the nineteen-forties and nineteen-fifties. The more severe design of the entrance above on the right, and here, has much to do with the State wishing to reflect its simple history and traditions. It is the entrance to the Marmar Palace, or Guest Palace at Rumaillah, constructed in the 1950s. The Palace would be placed in the hands of State guests for the duration of their stay in Qatar. Normally closed, the gates would be kept open on State occasions, but closed for the guests’ safety and privacy with guards positioned outside to protect the guest. It is not easy to illustrate a typical traditional Qatari door. Their design and construction varied with time, cost and area, particularly in their rural or urban styles although, as would be expected, they do share common attributes. 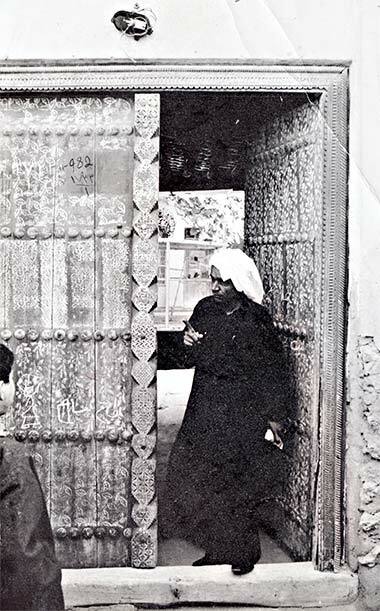 This door, photographed in 1972, has been chosen as it illustrates, as typically as possible, an urban door which would have been relatively expensive, though not ostentatious, and was located in one of the sikkak leading down to what is now suq waqf. In Western terms, it might be thought to be typical of a middle-class home. While the door above is relatively typical of doors seen around the centre of Doha, it is important to note that, as you might expect, these doors were seen as security devices intended to keep strangers out of homes and commercial premises. These darwaazah were usually constructed of teak and were of heavy cross-sections, in the case of this door, both the ’enf and the door and frame were substantial. However, visual relief was provided not only by the carving of the ’enf, but also by the provision of a robust carved rope moulding around the farkhat al bab, or wicket door, through which normal daily access would be gained to the property. Sadly, not many of the doors incorporated into the old architecture of the peninsula have been saved from destruction by the initiatives to create improved housing for Qataris. Here, a door lies half buried with the rubble from a demolished building in Doha’s suq. A similar pattern could be seen elsewhere with many doors being burned. 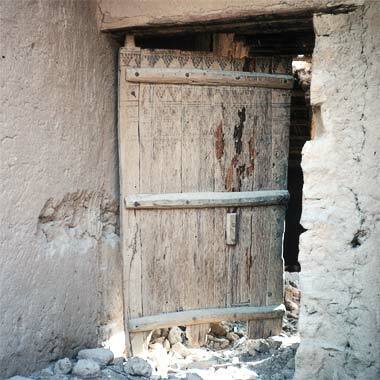 Wakra, for instance, had many half buried doors which had rotted by the time there was an interest in saving them so, nowadays, many of the doors which which appear to be old are either imported, extensively refurbished, or new, their designs and detailing made in keeping with what is considered to be the best of old traditions. The character of openings in boundary walls obviously developed with time. In the simplest buildings the door, bab, formed both the means of access as well as that of lighting and ventilating the space behind it. With small rooms a door opening was sufficiently large to fulfil the various requirements of security, privacy and limited environmental control. A door opening was the only access to the outside world in simple buildings and this would also be so when the original room was later surrounded by a wall to create a courtyard. To begin with it is likely that doors were a single leaf set in a strong frame, both door and frame usually being of teak. 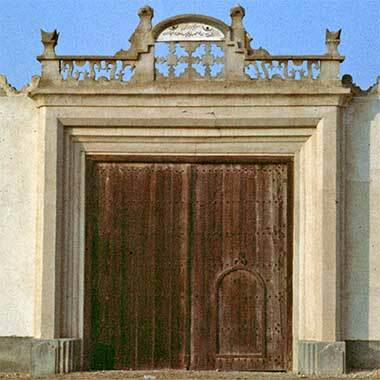 The door here, was typical not of Qatar, but of Saudi Arabia where it was photographed in 1981. The principles on which it was designed were also to be found on doors in the Qatar peninsula, though of more refined design. An example of this, set in a rural development, is shown a little way above where it can be seen to be a far more delicate design and construction than the Saudi example here. Of particular note is the pintle hinge, raha, used to swing the door. This example is also of a single door, this time in the centre of Doha, the design illustrating the importance of the wicket door, but also bearing the paintwork added to it after its owner rented the house to expatriate labourers. In a sense, this is one of the few examples that prove the rule: nearly every door you would have seen in Qatar would be a double pair – in the form of the one at the head of this note – the two leafs separated by a vertical post, ’enf, attached to one of them and through which the traditional locking device, mazlaaj, was fitted, and with one of the leafs containing a wicket door which would be the normal means of access through the doorway. Teak, the common timber used for these doors did not occur naturally in Qatar and was imported from East Africa or the Indian sub-continent. The lower of these two photographs, taken in early 1972, shows the tradition continuing at that time in its simplest form with a plain frame and planked doors, an undecorated ’enf, a steel mazlaaj and the door and frame painted a simple dark green. This really was a simple door, and unusual because of it. The design of doors and their doorways differed all over the Qatar peninsula, most likely dependent upon where their manufacture or craftsmen originated. It is impossible to say with cerainty where any of them were manufactured within the peninsula but it would be reasonable to assume some were made to fit a local door, but many are likely to have originated elsewhere either within or outside the peninsula. Wooden doors and windows were valuable commodities and they would certainly have been reused over time, not always on the same building. The first two photographs are of a simple embellishment to the head of the frame of a farkhat al bab on a domestic development in the desert in the north of the peninsula. This pattern, which resembles the Western fleur-de-lys is commonly found on many door heads. Whatever their origin many show definite signs of connections to other parts of the world particularly, as in this lower example, with the hinterland of Saudi Arabia. This detail of the decoration over a wicket door – the ’enf being the post on the left of the photograph, the architrave beading being on the right – is considerably more elaborate with carving not only in the finial design but also on the architrave to the farkhat al bab. Compare the door above on a house in the north of the peninsula, with this pair of doors in Rayyan. It is apparent that they are not new but are likely to have been constructed at the most, thirty or so years years ago. The whole doorway is relatively simply designed and in its simplicity is likely to have been considered as a functional doorway rather than one for display. The ’enf has been designed similarly and has two small details to refine its head and foot, again a common treatment to this type of door. While the carving of the ’enf and architrave is strongly modelled, the architrave around the farkhat al bab has been kept relatively simple with restrained detailing. The most elaborate element of the doorway is its outer timber frame which has a running design carved into it comprising three or four simple designs on recessed planes with a rope moulding masking the junction with the plaster frame. Of a different character from the doors above at Rayyan is this pair in Wakra, the gateway to the old fort of Sheikh Abdulrahman bin Jassim al-Thani. Here, in common with many or most doors in Qatar, there is only a single farkhat al bab. The fort was approximately square with its boundary wall around 120 metres a side. The main internal development was on the east side, particularly the south-east corner, and this entrance was in the middle of its south wall. The purpose of the doors at this position is not entirely clear to me as the main entrance to the fort was on its east side where it was properly protected by adjacent development within the curtilage of the fort. This suggests that the south entrance had more of a ceremonial function – though, if this was the case, it must be anticipated that it weakens the function of the fort. The gateway is essentially undecorated and has a simple character respecting the local traditional architecture. Above the gate is the shahada with a Quranic verse. Interestingly there are two sculptural devices above the columns defining the door that appear to resemble a pair of midakhn, and the carved naqsh panels between them have an interesting sinuous character to them that I do not recall seeing elsewhere. There is a little more written about the panels on another of the Gulf architecture pages. While many of the farkhat al bab, such as the first two shown above, have the top of the device at the head of the door in the form of a leaf, some of the doors have this element as a diamond, as in the pair of Rayyan doors immediately above. 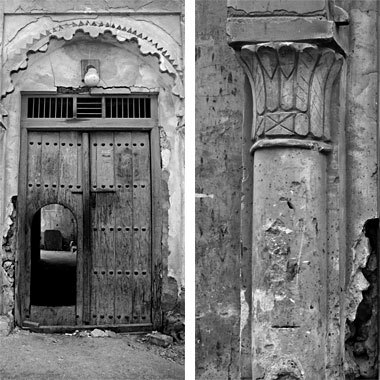 These two neighbouring doorways, photographed in Doha in 1981, and most likely belonging to the same family, exhibit the same or similar detail with a diamond at the head of the device. The second of these three photographs is a detail taken of the top of the farther farkhat al bab, showing how the diamond has been set relatively high above the two supporting leaves to create this typical head detail. The third of these three photographs is a detail of the head of the nearer farkhat al bab showing staining from weathering above the device. In this example the diamond has developed into a square set at 45° and dropped down considerably into the design of the device. A notable feature of most if not all of these doors is that the architrave surrounding the farkhat al bab appear to be constructed of two pieces of wood meeting at the centre line of the door. This suggests that there is considerable waste in cutting from a wide plank, so increasing the cost and, thereore, value of these doors. In this next example the framing of the doorway is again the most complex of the wooden elements, but it is matched by its relationship with the traditional naqsh running motif which is found all over the peninsula. Some thought has gone into the design of the carved feature that forms the architrave for the farkhat al bab, with the head piece having a pair of small shoulder spur features added below the fleur-de-lys device. This detail is from a new pair of large doors on a building near the Rumaillah fort. The building is a pastiche in the fortified style and I imagine that this door has been designed to match. It is not a Qatari style, however, neither in the design of the three finials rising above and out of the architraves to the farkhat al bab, nor in the treatment of the running design and the top of the ’enf. This photograph shows a considerable departure from the traditional way of detailing the head of a farkhat al bab. The styling of the ’enf on the left suggests it belongs to one of the new wave of buildings constructed in the sixties in Doha. But the device over the farkhat al bab has a resemblance to designs coming from the Saudi hinterland, a design which might be associated with the shape of a palm tree. This door is associated with a masjid in the Heritage Park, north of Doha and exhibits an interesting approach to the interpretation of traditional architectural elements. Although this looks like a traditional door, there are significant departures from tradition. It appears that the whole of the door opens, not just the wicket gate in the centre as might be anticipated were the door to be an old one. An old style of handle on the left operates the door’s opening. Secondly, the mazlaaj is there for decoration, not as a working part of the door. It is detailed as if it locks to the right but can’t be moved to the left were it to be an operational mazlaaj. I have also not seen a mazlaaj of this type used on a wicket door; they are usually fixed to lock against the central ’enf of a double door arrangement. The carved decorative elements of the mazlaaj and the trim around the wicket door are simple, but not really in keeping with traditional detailing of the peninsula, nor is the crescent, though it has to be said it is an attractive finial to the door. Having made all those points, it has to be said that the door is attractive and hints at the relationship with local traditional design. But, compare it with the next, authentic, door. This pair of doors, or darwaazah, is situated in Wakra and represents a normal, functional arrangement for a large scale domestic complex. The building in which they are located was probably built around the nineteen-fifties or sixties from the style of its architecture, so I assume that the doors are contemporary with it. They appear to have lasted well and are likely to have been constructed with pintle hinges as is witnessed by the detail of the pairs of vertical baazur added at the hinge end of the two leafs in order to fix the doors to the vertical pintle timber. The doors have not dropped with time which suggests they were well made. There is a small amount of wear shown by the timber architrave to the farkhat al bab, a common feature of these doors due to their constant daily use. The detailing of the ’enf is simple with only a small amount of carving at its centre point. The architrave at the top of the farkhat al bab has a simple version of the decorative detail that is commonly used in this position. Here is an interesting pair of old doors that appear to be used in a different opening from their original location, though there is the possibility that there might have been an overpanel allowing ventilation as was often the case. But the reason this pair of doors is shown here is for their decoration. 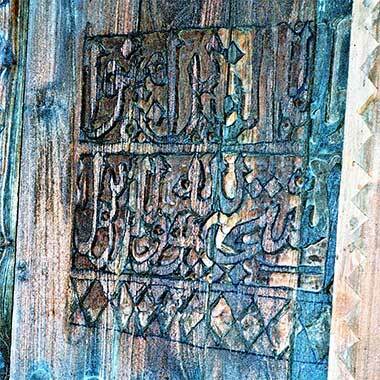 This cursive form of carved timber decoration is not uncommon on old doors. What is uncommon is the manner in which the elements have been put together to form an attractive frame. There is no attempt to make a panel for the carvings; they are applied directly to the panelled door. The origins of the decorative elements appears to be the Arabian hinterland. This, too, appears to have originated from the same region and is a very attractive development of the traditional surrounds of a farkhat al bab. Even though this is a more involved design, the vertical elements of the architrave have been kept straight and simple, and the shoulders at the head are both relatively short and neatly integrated with the verticals. The ’enf is of a robust character with eight point geometrical designs together with a vegetative design incorporated into its panels. This is a similar decorative timber element to those shown above. Carved from a piece of teak the item is about 220mm long and was fixed to another door with wrought iron nails. Although it is shown here horizontal, it was pinned in place vertically. There is a similarity to it with the decorations on the door shown above, and there might be thought to be the hint of a date palm in the form of the carving. Similar in concept to the door above, this door has extremely tall horns as a continuation of the vertical architraves adjoining this farkhat al bab. The door was photographed in Doha, 1975, but suspect it may have come from Saudi. It bears characteristics suggesting a Saudi origin and might easily have been transported to Qatar for use in a residence there either by a family moving there or as a commercial opportunity. It is of a simple construction with no curved elements, the simplicity being reflected in the character of its carved elements of both the frame and the ’enf. With time a double door evolved with two relatively narrow leaves closing on a large central post, ’enf, or nose, attached to one of the leaves. This photograph shows a number of their simple, different designs. A wicket gate, farkhat al bab developed, normally within the right hand door which made entrance through it more difficult and, presumably, made it more easy to defend. The central door post was highly decorated with two or three-dimensional carved patterns, and was a feature of the house. On the best examples there was also considerable carving of wooden architraves, sherbala around the door, as at Wakra. Although the designs are carved deep and have a three-dimensional quality to them, they are essentially based on two-dimensional designs. Generally speaking, doorways in the Qatar peninsula tended to be rectangular, sometimes with curvilinear decoration within it. This photograph, illustrating the most extreme form of decoration of this sort, was taken in the ruined town of Wakra many years ago. Not only has the decoration a form unusual to the peninsula, being more associated with the Arabian hinterland or even the Indian sub-continent, but the decoration narrows at its lower level, the running pattern being extremely typical of Qatar decorative naqsh that can be seen in many parts of Qatar. It is worth remembering that Qatar had the richest architecture of any of the settlements in the peninsula. 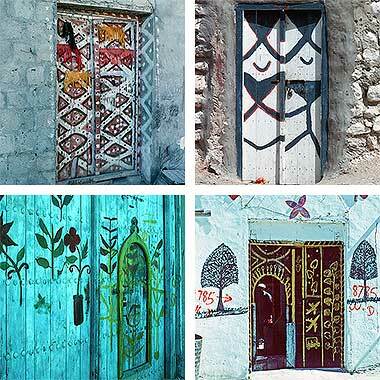 There were many decorative treatments applied to doors and doorways in the older areas of Doha. The upper part of this doorway, photographed in Musheirib, illustrates how the importance of the entrance has been enhanced by the addition of attached columns and their capitals. The columns are not structural nor do the capitals have anything other than a visual significance, but they create an attractive setting to the door adding scale and importance to the design. The access door to the property is now steel, but is likely to have originally been a traditional timber door. Note that the capitals appear to have been painted blue at some time and the entrance may well have had a multi-coloured paint treatment. They have been designed in the Egyptian style utilising a more refined version of the lotus or papyrus leaf design of the capitals in the next entrance illustrated below. Near the centre of Doha’s old suq is this door shown below which, in 2007, I believe is in the process of being restored. Here I have illustrated it in order to concentrate on the details I think are important. The first things to notice are the size and proportions of the door. They are large and reflect the importance of the development in which they are located. I have to admit that I can’t recall exactly the building it served, but believe I remember it as being on the west edge of the suq. My guess is that it was one of the commercial properties or, more accurately, a building owned by one of the major traders in the suq. The staining on the door tends to support this. Although the door and its doorway are large, the door is not decorated and appears to be designed for function rather than being status driven. This is particularly noticeable with regard to the ’enf which is totally, and rather unusually, undecorated. However, the plastered setting for the door is decorated, but not as you might expect. The arch with its two- and three-dimensional carving is relatively traditional for the Gulf, though has a larger scale than is normally found. The columns, however, are very different owing their origin apparently to Egypt with their lotus or papyrus leaf design which is rather crudely executed. In the construction over the door there are two more details which are worth noting. Firstly, there is the standard ventilation solution above the door where the opening is protected by wrought iron bars set in the teak frame and, secondly, the later incorporation of an electric light to illuminate the entrance. This is likely to have been added as late as the nineteen-seventies. The photograph above illustrates the common solution to the traditional requirement for ventilation over doors in urban areas, albeit in an upmarket version. Generally such openings are the width of the door and an element of the timber door assembly as shown. But the solution illustrated in this photograph is from a rural building near al-Khor and shows a more affordable solution set above the door of a simple room otherwise ventilated and lit by only a door and window. It is not possible to tell how the ventilator was finished, but it is likely to have been left as is, with a juss lining to its internal walls. A more upmarket finish might have seen a piece of perforated naqsh covering it though, at this size it is probable that such a finish would not have been suitable as it would have restricted air movement through the limited opening. This is a simple solution to a perceived need for permanent ventilation. I must apologise for the quality of these next five black and white photographs. Recently I discovered in my files a photocopy of an old article in Arabic dealing with traditional Qatari doors. These photographs were taken of the photocopies so do not have the quality of most of the other photographs on the site. However, I thought they are worth placing here for record purposes as some, if not all, of the doors no longer exist. This first photograph illustrates only too accurately the condition of many buildings in the peninsula by the late nineteen-sixties and early seventies. I am not sure where the photograph was taken but believe it likely to have been Wakra or perhaps Doha. Note the length of the steel bolt which is considerably longer than usual. Being unable to see the other leaf, it is not clear why this would be so as the throw of the bolt needs only to be around 150mm to 200mm in order to secure a door through the ’enf of the adjacent leaf. The next photograph shows a large door with a strong ’enf that uses a pair of steel or wrought iron bolts instead of the earlier traditional wooden bolt, suggesting it to be a later door than that in the third photograph. The unusual feature of this door is the double bolt system, presumably added for additional security, both bolts being secured to hasps by padlocks that appear to be missing, a suggestion that this is part of an abandoned building. Here you can see a good example of a mazlaaj on an old pair of doors. A little more is written about them below. There is a beautiful carved ’enf in the centre with a handle on each leaf through which the wooden qifl runs. These traditional locks were not completely secure as may be imagined, so it is no surprising that with the availability of steel rods, the opportunity was taken to use them as bolts together with commercial padlocks. It is interesting to see that the owner of the door did not take the old mazlaaj away when he installed the steel bolt and hasps. This photograph illustrates a beautiful traditional doorway with its darwaazah. Again, I am not able to say where it was but I believe it is most likely to have been in the central area of Doha. The doors show signs of heavy use which suggests this may be the entrance to a property belonging to a merchant as I note that a small ramp has been added to the steps to facilitate wheeled barrows being moved through the doorway. The scale of the doorway is majestic and suggests that a craftsman would have been responsible for its construction. The setting of the door has been given importance by its framing which is set on a pair of attached semi-circular columns, presumably constructed of hajaraat or faruwsh and juss as would be the rest of the wall. The attached columns rest on simple bases with no capitals at their heads. The over panel frame is simple, but what sets this design apart from many other doors is the semi-circular ventilation opening above the door with its fan design which appears to have been constructed with wrought iron or steel rods. There is one odd element in the design of this doorway and that is the mirzam whose shadow can just be glimpsed at the top left of the photograph, and which is placed to create something of a nuisance to those using the doorway when it rains. The darwaazah themselves are relatively simple. The small number of vertical planks suggest quality with the misaamir creating their usual impression of strength. However, the doors are obviously old as they are out of alignment, the left hand leaf having dropped around 75mm. It is probable that the pintle hinges have worn down as it is possible to see that steel or wrought iron strap hinges have been added to the bottom of both the door leafs. The ’enf is simply carved with this simplicity mirrored in the detailing around the farkhat al bab or wicket door. Note the detailing of the head of the ’enf shown in the photograph below. The architraves around the door frame are finished with a combination of scalloped and chevron detailing as can be seen in this lower detail. 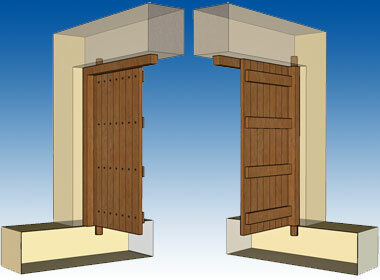 Finally, note the vertical pairs of misaamir that have been added at the hinge side of the door leafs in order to strengthen the fixing of the planks of the door to the supporting vertical timber pintle hinge – illustrated below – on the inside of the door, a functional requirements that creates an attractive decorative embellishment on the external face of the door. Not every traditional door was treated as an overall design with the door, architraves and ’enf organised in a harmonious grouping. Often this was due to the re-use of older, valuable doors set in the opening of a new or redeveloped wall. However, this door head, photographed in Wakra in the early 1980s, has an attractive arrangement of panels, misaamir, ’enf and architraves apparently created contemporaneously. The treatment of the top of the ’enf is particularly well considered and is similar to many of the older traditional ’enf designs in the peninsula. It can be compared with the ’enf and its head above which has a more refined, urban character to it. The design feature of a ventilating over-panel can be seen all over the country, not just in urban settlements where you might expect it in dense housing separated only by relatively narrow sikkak, but also in relatively loosely situated desert locations. Here is the entrance to a residential compound built, I would guess, in the late nineteen forties or fifties, which has a ventilation grille above the main entrance door. Incidentally there are a couple of clues to the suggestion that the compound is now lived in by expatriates. In the upper photograph both doors are open and, in addition, the boundary wall is unfinished. In the lower photograph, the pink and green tiles are unusual both in colour and in their application adjacent to three rather fine perforated naqsh panels. The heavy details of the porch entrance to the compound are typical of Doha architecture of the late nineteen forties or early fifties. There are a number of photographs on this page and others illustrating openings above the entrance doors to properties, suggesting that the opening is required for ventilation, even while posing a risk to the security of the property. But there are also examples such as the first here, photographed at Umm Swaijah in March, 1972, when the entrance door opens into a courtyard in the desert, suggesting either a visual tradition, one which anticipates further development enclosing the entrance space at a later date or, more probably here, the use of an existing doorway in a new setting. The manner in which the opening has a lintol over it supporting a small amount of masonry suggests both that it reusing an old door as well as there being an importance or formality to the entrance. The central photograph was also photographed in an external wall and shows that the frame was designed to incorporate a grille. In this example it might be argued that the grille gives more visual strength to the head of the door, perhaps a factor in the use of this feature when used in a boundary wall. Interestingly, it is not only the small developments which have this feature incorporated within their doors. This example of an open panel above an entrance door within a boundary wall was photographed on a palace entrance in 1975. The difference between it and the other more domestic examples shown above and below is that the grille is incorporated within the door rather than being in a panel above it. Obviously steel doors are more suited to this treatment than traditional timber doors. This photograph illustrates the incorporation of panes of glass in the over-panel. It is not an unusual detail as it is one which can be seen in many similar old doorways. In this case only two of the openings are glazed suggesting a continuing need for ventilation, though the fact that the glass is fixed up to the steel or iron bars suggests that it was a later addition, perhaps with a decorative purpose in mind. I have no idea why the above detailing is as it is, but here is an example where the possibility for openings has been designed into the doorway. However, instead of the panels being open for ventilation or lighting, they have been closed with wooden panels. The central panel suggests that this might have been different at some time and subsequently closed but, open or closed, the overall door frame was designed to incorporate these panels which would be more likely for practical rather than aesthetic considerations. The door was normally suspended on pintle hinges, raha which were of a scale and character strong enough to match the materials from which the door and frame were made. The top and bottom of the end vertical plank was extended to form the pintle. The ends of the raha were either let into stones at the head and foot of the door or, later, into wrought iron sockets built into the walls. This last pair of doors are here solely to illustrate a couple of functional doors situated near the suq in the centre of Doha. Taken in 1986, the photograph shows doors to stores used by merchants, supervised by expatriates as the bicycle indicates, and very typical of many of the doors around the suq where merchants kept their goods though in which nobody lived. Where there had been Qatari families living in the centre, they would have moved to the new housing located in Medinat Khalifa and elsewhere on the periphery of Doha when the government began its programme in the 1970s providing housing for nationals. While it is not common for the faces of doors to be carved in a decorative manner, a number are. Generally this takes the form of a calligraphic religious statement, the most usual being the bismillah or, sometimes, a date. Where there has been a date I have seen them from the early 1920s to the early 1960s. This first example is of the head of a door carved in a manner which combines simple geometry with vegetative motifs. It is interesting to see that some effort has been made to match the patterns with the widths of the boards, despite their different sizes. The second door shows signs of heavy use with metal reinforcement out of picture as well as a traditional qifl. The centre of the door has two carved panels, one each side of the ’enf, the bismillah being the two lines in the panel on the left. While it is not easy to see at this scale, the calligraphy is imaginative in style, and a lively example of its sort with a freestyle diamond pattern carved below the calligraphy. This heavily worn door was photographed in Doha in 1980 and illustrates a higher quality of calligraphy to enliven its face. Doors like this are used as a means of expressing a religious statement relevant to the owner of the house and, perhaps, the family. Here the religious panels are kept to the top two panels, the lower two panels having a small amount of figurative work, but no calligraphy. It is possible the calligraphy might be more than just an expression of faith, perhaps having a talismanic value, a residual of pre-Islamic traditions, one which is continued by present day sailors. This door, photographed within the inner ring of Doha in 1981, is a good quality teak door, judging by the treatment of the ’enf and architraves. While the calligraphic work on the face of the door is inventive, curiously it seems not to make sense. It is partly Quranic in origin but the ’enf covers some of the calligraphy and there appear to be words missing at the beginning of the right hand panel. On the left hand panel there is an Islamic date, 1346, equating to the Gregorian 1927. In contrast with the rich decorative treatment of the above doors, this example was photographed in 1986 on the edge of Doha at that time. Although difficult to read at this scale, the door has been carved in low relief to resemble a panelled door, the panels being set between the horizontal rows of baazur, and each of the panels being carved with a vertically oriented diamond pattern. A simple ’enf has been added to enable the door to continue to fulfil its security function, but suggesting that there was thought to be no reason to embellish the door. Curiously, the fact that the door imitates a panelled door, suggests that it was constructed following the introduction of cheaper doors of panelled construction. There seems to be no rule as to what is decorated on a door. Usually, where there is decoration it is mainly on the ’enf, around the farkhat al bab or on the frame to the door. This next pair of doors were photographed in Abu Dhabi in 1972 and are very different from those found in Qatar in many respects. Here the carving is applied only to the face of the door. The frame and threshold are simple teak timbers with no decoration as is, unusually, the ’enf. In both of them the iron bolt has been fixed to the door and through the ’enf regardless of the pattern of the door, suggesting that to the owner, security was of more concern than the decorated appearance of this important element of the house. The doors of the top example have each been constructed of two teak planks each fixed in four places by three mismaar hadeed dome-headed wrought iron nails. The decisions governing the geometry of the carving are interesting. The semi-circles of the upper semi-circular headed panels have been divided into eleven segments, requiring the central segment to be cut at the junction of the two panels. Contrasting with this, the ovals below them are divided into twenty segments, the junction of the two panels being between the segments.Why, on both these doors, the circular motifs should be oval and not truly circular, I have no idea but it is notable in the lower door that there are a significant number of tear-shaped motifs, a deliberate distortion of the circle, perhaps indicating its leanings to the Indian sub-continent. In the lower example each door is a single panel fixed in four places by four mismaar hadeed nails. Perhaps because of the size of the panels, each has cracked vertically, though the construction and materials will still give the doors strength. In contrast with the door above it, this door has a decorated ’enf, though the carving is very different from that characterising Qatari doors, being lineal with a diamond motif at its head. Oddly, there appears to have been no similar device at its foot. The top, semi-circular headed panel has shoulders at the setting of the semi-circles, the latter being divided into six segments. Below the semi-circle, the rectangle contains thirty tear-shaped motifs, five horizontally by six vertically. The central pair of panels are odd-shaped; that on the right is almost a circle, that on the left, oval. Inside the device there is the same foliate motif, distorted to fill the outer frame. In this door, there are two decorated panels at the bottom. In each there is a diamond device with four surrounding tear-shapes radiating from its centre. The decorative treatment of the wooden doors above relates to doors which were usually constructed to have patterns or calligraphy carved into them, enlivening a part of the surface with a textured design. While this gave a distinctive visual appearance to the doors, one which indicated an better quality of door, a reflection on the Qatari owners, the departure of nationals to new houses and the renting out of accommodation to expatriates introduced another form of decoration – the painting of both the doors and the walls containing the entrances. This work was essentially personalisation, and was carried out with a small variety of images, most of them relating to religion, vegetation, country of origin and, interestingly, means of travel. These four doorways illustrate some of these aspects as applied to traditional timber doors. Generally the designs exhibited on these doors show little or no great artistic talent, but this tends to make them more lively and interesting to deconstruct. This first example is a simple treatment, more or less ignoring the ’enf with the painting in white on black of five diamonds, the white having dots perhaps replicating fixings. The inner face of the cement surround to the door has a running zig-zag decoration, and white dots have been added to the surrounding face of the cement block wall. The horizontal orange and red ribbons are made of cloth and are likely to have been added for a festive occasion, perhaps the hajj or one of the ’eid celebrations. Recently, sorting out some old files, I came across a misplaced and old, crumpled black and white photograph that I do not recall having taken, but which I believe would be dated back to the early 1970s. I think it could only have been taken in Doha. It appears to me to be an important example of a door and its ’enf as the door and ’enf are of a very heavy construction suggesting the aim of the owner to ensure his property was adequately protected against a possible attack. Significantly, I can see no evidence of a mazlaaj on, or having been on, the face of the door, and have to assume that the locking device must have been covered by the man at the entrance to the property and who, incidentally, has the appearance of a trader. There is no kuka or farkhat al bab in either door leaf reinforcing the suggestion that the door would always have been locked from the inside, in turn this suggesting a gatekeeper in charge of security to what is probably a commercial property. The design of the door is simple. The five bands of misaamir hadeed attesting to the regular location of the horizontal timbers behind the face of the door to which the vertical facing timbers have been fixed, each with three of the misaamir. The ’enf has also been carefully designed with alternating long and short patterned elements – six short and seven long – these long elements including the slightly shorter top and bottom elements of the design. It would have been good to see a better relationship between the vertical patterning of the ’enf and the horizontal treatment of the door’s construction, but this suggests that the door and ’enf were either made at different times – often ’enuwf were re-used – or that the carpenter did not consider this to be important. One of the reasons for adding this photograph – in addition to having a record of the door – is that it is covered in what appears to be an elaborate painted decorative pattern. The pattern appears to be based on a leaf and naturalistic surround, and has apparently been applied with a stencil. Curiously, the pattern has been applied to the three-dimensionally carved ’enf. This is the only example I have seen of this scale and character of decoration to a door. This next example is of one of the simplest door designs I have seen. Photographed in Doha in 1975, the house was constructed of hasa, the door being a simple construction with the standard bolt securing the ’enf. The colours, white and green are significant and often associated with the Indian sub-continent, but it is difficult to imagine what the lineal elements were intended to represent. The two horizontal, curved lines are likely to symbolise the moon. The lining of the green pattern in contrasting red is similar to the manner in which the lines in the illustration above were drawn. Here the door has two significant characteristics to it. Firstly the use of the colour, green, the whole of the large door being painted in a pale green with a pale viridian green applied to pick out the sherbala of the farkhat al bab or wicket door. The floral decoration appears as individual specimens with green stalks and leaves and dark red petals, though some leaves are also painted dark red. It was not uncommon to see flowers being grown inside and outside expatriate housing, and for flowers to be carried in the hand or worn. 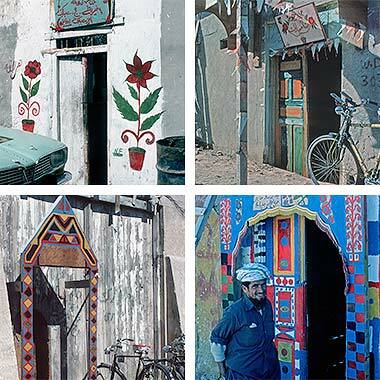 This photograph of a painted entrance also shows invention and naïve artistry compared with some of the examples seen on expatriate housing. Here considerable care has gone into the depiction of the two trees standing on patches of grass and framing the entrance doors. But while the painting of the doors appears to be the work of a different hand and is relatively crude, especially around the farkhat al ban the right hand door has two aircraft and a car drawn on it. Perhaps the Pathans living here were illustrating the means by which they came to Qatar and their employment for the Taxi Association. The illustration of aircraft was not an uncommon feature or expatriate housing. Contrasting with the doorway above in the level in its artistry, this decorated doorway appears tp have been carried out rapidly and without any real plan, suggesting it might also be the result of celebrations for the hajj or ’eid. It incorporates a mixture of calligraphy – in this case Muslim names, most probably of Pathans – lineal patterning, floral decoration adjacent to the doorway and the moon and star symbols on the left hand door. The dark red decoration on the frame and ’enf appears to be made of strips of a textured carpet. These four doors illustrate a little more of the range of styles used to decorate doorways. The top left example is similar to that above in using two planting motifs, a potted flower each side of the door. Some thought has gone into the painting and it appears that the artist has appended his initials bottom right. The remaining three doorways all have the appearance of having been decorated for a celebration, and are unusual in that there is a constructed element outside the face of the door or doorway, with the top right doorway having a canopy providing a degree of shade outside the entrance, while the bottom left entrance is unusual in that a floating door frame has been erected around 400mm from the face of the building and simply decorated with lineal and diamond patterns. The doorway bottom right is certainly one of the more unusual decorative treatments seen, with a strong blue ground on which there are names, the Pakistani flag and stylised plant arrangements. Here is a more extreme example of decoration to the façade of a building, perhaps not quite an example of door design, but certainly incorporating it. The plant motif has been used extensively with some degree of invention used in the display of both leaves and flowers. A small amount of paint has been applied to the door itself with a yellow painted edge trim used to outline it. Above the door there is a note relating to the hajj between the two flags of Pakistan and Qatar. It appears that the occasion of the hajj is celebrated by such decoration. In this example, the decorative treatment is more simple, but is equally effective in its application to its position. As with the other examples above, the house has been rented out to expatriates who have taken time to paint the outside wall and door. Situated within a sikkak system, the front and side wall of the boundary wall has been painted blue with a contrasting line of yellow used to pick out the top of the wall and, unusually, the vertical corner. The double lines at the top of the wall have vertical green lines spaced between them and this motif is picked up on the yellow line outlining the doorway though, curiously, the horizontal line above the door has v-shaped decoration rather than the lines on the verticals. Outside the horizontal and vertical lines there is a motif which, perhaps, has a resemblance to a plant and has a random colouring of red, yellow and green. The farkhat al ban itself is of crude construction, but it is interesting to see that the two verticals are taken up, replicating the shoulders used on some of the more sophisticated doors. This example of a painted façare is the most extreme I saw, or at least recorded. Taken in 1972 it is not clear if it was being lived in by a Qatari family or by expatriates, though I would be surprised if it were not by the latter. The panel to the right of the door, as well as the panel over it, both bear a stylised version of an Islamic garden with particular emphasis on mature trees and water. Above the panel to the right there is a heavily stylised version of what appears to be a member of the cat family, perhaps a cheetah, along with a crescent and star. Elements of the façade have what appears to be a roughly executed false marble treatment to enliven it. Altogether it is an extremely unusual façade and addition to the urban scene. While many of these examples of painted traditional doors show some consideration for the decorative treatment of a whole door or doorway, the example above together with this example also illustrate an irregular approach in the painting of these old doors. This particular door suggests that there was not enough paint to finish the job, and it was just left in this state. From memory it appears that the colour green was relatively common for the painting of doors. There is a religious significance to the use of this colour, but it also has associations with nature, particularly with grass, trees and flowers which seem to have a significant meaning to those from the Indian sub-continent. Having said that, a number of these doors have a strong red used on them, particularly in the example above and the central door here. The door on the right of these three examples is interesting by comparison as it uses yellow with a similarly toned blue to suggest a pattern I associate with a simplistic tree structure. Here, too, the predominant colours of the entrance are green and red, though it is not the door that has been painted green but the lower half of the surrounding wall, the upper part being painted white. A horizontal blue line has been added corresponding to a difference in colour on the adjoining walls, and two white painted timbers have been used to trim the farakhat al bab, though the trim does not extend across the foot of the door as might be expected. The head of the farakhat al bab has been painted red, together with the outside frame of the door. Although there is an impression that every ’enf has a carved decorative treatment, these two entrance doors to adjacent properties illustrate that this has not always been the case. Photographed in 1972 it is possible they were replacements as the doors to which they are attached appear to have taken more wear than each ’enf. However, looking at them in detail they are probably coetaneous with the doors on which they sit. Both of these examples has a modelled profile running down them, that on the left consisting of a half round profile in its centre with quarter shoulders supporting it, while that on the right has a flat face supported by quarter round profiles on each side – but having a classically completed base and head. Oddly, there appears to be no way of locking the left hand leafs of each door from the outside, only the farakhat al bab being fitted with a locking system. The two examples shown above are certainly simple in their detailing, but the carved examples often have a simple character. The point to make here is that it is simplicity of detailing which best characterises Qatari design generally and the ’enf in particular. In Qatar the carving is nearly always two-dimensional in conception and rarely has cursive designs in it. This is different from similar design in States such as Dubai and, certainly, the Oman. In the centre of this photograph is the exception that proves the rule for two-dimensional design where there is a definite attempt to give depth to the design by stepping back. A possible reason for this might have been the need to maintain the structural integrity of the ’enf that would be compromised by too much material being removed. These pages contain a number of examples of doors incorporating an ’enf as their central feature. Their carving is one of the most recognisable characteristics of Qatari design vocabulary. Because of this it might be useful to show details of them. Because of their vertical positioning, all the following examples will be shown horizontal. All these details are of only a part of the ’enf, but are usually a significant focus located approximately in its centre. One particular point to notice is that the ’enf was generally fixed to the teak planks behind it by a large wrought iron mismaar or nail. Although it was usually fixed to the horizontal centre of the ’enf, rarely was this seen to be an element of the design of the door or ’enf, but was hammered through in whatever place appears to have made structural sense. In this manner, the design of many of the designs were adversely affected. This first example, a detail of the centre of an ’enf is shown here first as it represents an unusual character of carving for Qatar. As can be seen the front of the ’enf has been carved two-dimensionally along most of its length with a running, cursive design, apparently based on a naturalistic interpretation of a plant and its leaves. It is not geometrically accurate as might be anticipated, and this helps to create a more lively design. It is the only example of this sort I have seen. The first and third details here are interesting in that they appear to represent a similar model which relies on an interweaving design interacting with a square grid. In a sense these are infinite patterns constrained by the frame. The first and second details have patterns set within a single lined frame, the frame being the same outline in both cases. This form appears also in naqsh design work within the architectural vocabulary of the peninsula. The first, more simple design shows that the square elements have been carved to represent a grid on a single plane, but the curved elements have been carved with breaks in their junction with the square grid in order to give an appearance of their weaving over and under it. This design appears on a number of different doors, sometimes set out, as here, on the diagonal or as a running design at right angles as shown in the third of these three photographs. The middle design is more sophisticated and will have had to be laid out more accurately. The resulting pattern is similar to the traditional axehead design which is to be found all over the Islamic world, as well as further afield. There is a detail of its construction on one of the geometry pages. Here the emphasis tends to be on the heavy line rather than in the recessed axehead form. It is significant that the teak from which it was carved is capable of carrying this amount of detail. Examination of the other two examples shows that weathering can significantly interfere with the design. The first thing to note about this pattern is that it is set out within the same framework as the two details above. However, this design is of a different pattern from those above in that it is set out as a series of running circles, four-and-a-half by two, and very similar again to some traditional naqsh work, the design being established on four-point geometry fitting accurately within its frame, and not being cut off as happens in the three examples above. The next two details are of a very different character from those above. Both were photographed in Qatar but there is a feeling of the Saudi hinterland in both of them. As mentioned elsewhere, there was considerable value in items such as this and, with movement in and out of the peninsula, a number of doors and their associated elements were brought into the country and incorporated into new houses. The first of the two details is of a loose knot arrangement with a good attempt to show its interweaving accurately, but with simplistic and slightly illogical infill pattern. Again, the overall framework is the same, or at least similar, to the frames of the patterns in the examples above, but the setting out is inaccurate, the diagonal lines deviating from being parallel. The second of these two details appears to be a naturalistic representation of pairs of leaves delineated with a heavy outside line within a carved frame of similar thickness. This example appears at the top of an ’enf – the top is on the right – and it is notable that there is no special treatment there, the design terminating within its frame with a pair of smaller leaves distorted to fit within the frame. Note that the containing shape on the left, or bottom of the panel is, again, similar to those above. This next group of details are all taken from the same ’enf and illustrate a very simple character of patterning used in Qatar. All the details have their base in four-point geometry, an easy way to establish a pattern with simple tools and where high accuracy is not required. The first photograph shows the top of the ’enf – the end being on the right – where it is notable that there is no special treatment to the design. There is always a possibility that an ’enf might be cut down to suit a smaller doorway, but looking at the design it is unlikely in this case, and such a treatment would be unusual. The five interlocking circles use their overlap to create the simply carved pattern, though the small, divided square pattern scribed within the circles is not as imaginative. The lower photograph illustrates the probable geometric basis for the pattern and, while there are a number of departures from the construction lines, it is the most likely way in which the teak was marked up and carved. The setting out of the small squares was probably made by eye as they follow no obvious logical lines. With the accurate layout of the pattern at the top of the ’enf it might have been anticipated that this central pattern could have been laid out as a square on the diagonal, but it is evidently not the case. From the way this pattern is laid out it appears that it was executed freehand with no real concern for geometric accuracy. However, the effect is attractive and links well to the next element, the decorated circle. Contrasting with the geometry in the above photograph, there appears to have been a real effort to use four-point geometry in laying out this rosette, even though it is linked to it. While there is still a significant amount of eccentricity in the execution of this part of the panel, the design appears to be based on an accurate geometrically based pattern. As with many examples of patterns which have been laid out geometrically, it is difficult to know whether the layout lines would have been on the centres of the pattern or on it edges. The cruder the carving, the more difficult it is to tell, but it is likely that the carver would not have worried too much about any departures from the geometry. This lower illustration shows the probable basis on which I believe the carving was made. This next group of four photographs come from a different ’enf, one which is likely to be of a later date and more expensive than those shown elsewhere. In many ways, it is also more representative of the traditional architecture of the peninsula. Its most striking feature is that a considerable part of it has been carved back in equidistant steps creating areas of its face in which two-dimensional designs have been carved. While this ’enf has been selected for the character and quality of its three-dimensional form, nevertheless it shares a striking number of similarities with the ’enf illustrated above. This first small panel is a case in point, apparently having exactly the same geometrical construction as that above, albeit here enclosed within a square frame as opposed to the circle above, the diagonal geometry, though not quite integrated visually, fitting in well from a design point of view with the recessed steps. This panel is another design link to the ’enf shown above and, like that ’enf, it is also located at its head. While its overall shape is well integrated into the three-dimensional carving of the ’enf, the minor decoration within the carved circles is different, this time having what appears to be a shaped form dividing each into two in what is not as successful a design decision as that above. There are some larger panels on this ’enf, one of them illustrated here. It is a curious mixture of designs, drawing its detailing both from the symmetrical rosette shown above, as well as the curvilinear designs illustrated further up the page though, in this case, with the squared grid having been set on the diagonal. The symmetrical rosette has been cut in two, one half being at the bottom and one at the top of the panel, with the curved lines joining where best they can. The design would have been more successful had the lines of the curves and those of the rosette were of the same width, but the relative geometries do not marry well. The final two photographs illustrate more heavily modelled examples of the ’enf. The first shows in detail the stepped manner of the carving which contributes significantly to the visual animation of the ’enf, the effect being to present a running series of panels on the face, each carrying a two-dimensional pattern. This stepping is a feature of other aspects of the local traditional architectural vocabulary, and can be found both in the stepping of shurfa as well as in the articulation of some openings, and in naqsh detailing. The second photograph, taken in 1975, is of an ’enf in the Bastakia, Dubai. This example illustrates more clearly how much of the timber has been cut away for this type of decoration, and shows another character of two-dimensional pattern carved into the face of the ’enf. It is also possible to see how robust the farkhat al bab is from both the thickness of the timber as well as the size of the mismaar al hadeed used to fix the teak planks to the cross member on the inside of the door. The heads of ’enuwf come in a variety of treatments. As must have been explained in a number of places, the timbers used in building were valuable and, therefore, were reused and incorporated into ordinary buildings over time. Sometimes this resulted in their being trimmed to fit an existing opening as is made obvious where the patterns carved in their faces have been cut. Where the ’enuwf were designed for more expensive doors, then the two-dimensional or three-dimensional carving would usually take account of the door height and be designed to fit. In the most ordinary buildings the ’enuwf would not be carved or would have a simple treatment at the top, in both cases allowing for amendments to be made in their height to suit the doorway condition. The heads of these first three ’enuwf are examples of this simple detailing, though there are simpler versions which have no carving along their length and could be found on the more utilitarian house doors. The lowest of the three examples has a more sophisticated treatment than the two plain examples above, but the principle is the same allowing a degree of trimming to fit. All three of these examples were photographed in Doha in 1972. Many of the ’enuwf were carved along their length in two-dimensional patterns, as illustrated a little way above, the pattern stopping at the head with a simple trim. Here are two examples of this kind of design. The first is a curious one in that the pattern looks as if it should be continued further up the ’enuwf, and would have benefitted from a more framed treatment, particularly because the carving of the lower part of the ’enuwf is three-dimensionally very strong. In this example, note that the same pattern as appears above has been used on this ’enuwf, and is still discernible despite a number of coats of paint having been applied to the whole of the door and its associated details. Note, incidentally, the fixing nail right in the middle of the pattern, though the three plain ’enuwf above seem not to have been fixed this way. It is also notable that the wrought iron nails have been used as strong design elements of the door. Here are two ’enuwf, the first of which has a rather classical treatment at its head with the addition of a stepped projecting capping, and the carved treatment having a considered design, one which appears not to have been accidentally terminated. The second example shows an almost Egyptian papyrus plant treatment at the head of an ’enuwf with the face curving out to form, in effect, a two-dimensional capital. It is not clear to me why this type of treatment evolved but, had it been seen in a different climate, it might be thought that this type of treatment might be applied in order to protect the top of the ’enf from deterioration due to rain. It is certainly the case that some ’enuwf rotted at their foot, but there is usually sufficient protection at their head for this not to be needed. If this is so then this type of detailing may be solely, or mainly, a design decision. This ’enf bears a similarity to that above in that its front face curves out at the top and its sides are flat and unarticulated, albeit with a beading running round both sides and the face. The patterning on the face is of the knot type seen above, and the design element on the head has similarities with the design of the ’enf below it. Like the ’enf heads above, this head has been designed as an integral part of the ’enf, and could not be cut down to accommodate a different door height. Looking at the head of this ’enf it is possible to see that it, too, follows the pattern of those above in having its face curved out at the top. But what is significant is that the head of the ’enf is wider than the cross-section of the shaft of the ’enf. Regrettably, the face of the head has been covered with two Government utility department metal tags, but something of the form and the relatively complex detailing can be seen. By contrast, this ’enf, photographed in Umm Salal Muhammad in 1976, appears to be an amalgam of two elements. The top of the ’enf has clearly been cut and a header element added to it. Although it can’t be seen in this section of a larger photograph, the shaft of the ’enf has been designed to complement the two door panels each side of it, suggesting that the head was an element they wished to have added to the ’enf, perhaps because it is a local feature of these ’enuwf. These two examples of heads of ’enuwf were photographed in Doha in 1977 and 1981 respectively. They appear to be virtually identical which suggests they were a common pattern used on a number of doors. As such they may be considered to be developments of the earlier, straight ’enuwf. Although the upper of these two examples is heavily worn and broken, it is possible to see that the design, like that above, curves out at its top, and that the sides are slighly modelled to reflect the two-dimensional design on the face. That design has two kidney or butterfly shapes containing a sort of projecting kite shape, all three shapes on the front having borders containing diagonally squared grid to create texture. The example above, from Umm Salal Muhammad, has a simple fan shape carved into its upper projecting part, a little out of keeping with the butterfly shapes below it. These three black and white images of ’enuwf surfaced within a group of photographs of traditional architecture in Qatar made in the nineteen-seventies or eighties. They are three of a number of carvings applied to the head of ’enuwf to internal rooms within a reconstructed traditional development. It is interesting to contrast these simplistic carvings with the design motifs found on traditional naqsh panels and, particularly, to compare them with the head of the enf above – a larger element designed for an external location. The square set on the diagonal, the supporting sausage-shaped elements, and the lower transition from two-dimensional semi-circular motif to the three-dimensional carving of the enf are all common to these designs and can be seen on ’enuwf in other buildings. Note, however, that they are different from the more simple designs that were found on traditional buildings as well as from those associated with Saudi origins. Traditional Qatari doors often have an attractive trim around them. This trim has always been a necessary element in the design of buildings as there is a need to mask the junction between timber doors or windows and the masonry within which they are located, both in order to close or seal the varying gap between them, as well as to provide an attractive finish to the opening. This example is of a door frame in an urban situation and illustrates a reasonable standard of expenditure in its design and, compared with the detail below, a better mitre of the architrave. It appears that the architrave above was a relatively common design, at least in its outside scalloped detailing. In this photograph you can see a very similarly detailed design though the scallops are larger in scale, and there is a simpler design behind it. The junction of the horizontal and vertical architraves is poorly made which is surprising as this was obviously a relatively expensive piece of work. Between the naqsh wall finish and the architrave is a carved rope moulding which adds to the attractive finish of the doorway. Here, again, you can see a similar detail, though this is a far more sophisticated example. There are four parallel running details with the rope detail on the outside and scallops on the inside with the addition of a form of running button detailing between them. What is really unusual about this door is that these patterns run across the head of the doors themselves with the ’enf visually supporting the design with its head sitting below it. The ’enf itself is relatively simple in its design but its shallow depth shows its later development from the early models shown above. However, it is the running design across the top of the doors which is both rare and unusual in its design. It appears to have been carved out of the solid timber and does not have the character of carving usually found in Qatari carving in that the sides of the designs stand at right angles to the plane of the door and are not carved at an angle as might be anticipated. This carving is common not just to the head design, but also to the ’enf. The pattern of the design is evidently based on a figurative interpretation of foliage, something not usually seen on doors, nor is it characteristic of naqsh work of the peninsula, but appears to relate to designs in the Saudi hinterland. The details illustrated in these two photographs were seen at al-Mufjar in the north of the peninsula. Photographed in 1985, the building was apparently not old, but was either built in the traditional style or had been renovated as such as can be seen from the first photograph. It appears to occupy a median position between a traditional and new design as can be witnessed by the height of the bottom of the window. In a traditional building, this would be lower, but in a new building, higher to accommodate modern furniture. The design and construction of both the door and window support this. Note the wooden window safaqa and the door with its ’enf and ventilation over-panel – both within the door frame as well as another opening some way above the door. There are a small number of interesting aspects to note. First the builder has constructed the running chevron details not in wood, but in cement render, distinguishing it from the surface of the building’s textured wall both by raising it above the plane of the wall as well as by its smoother texture and slightly different colouring. The chevron pattern has been further enlivened by the addition of simple lines used to break down the overall plane and small circles impressed into each triangle. Note that this is similar to the timber architrave detail below, and might be considered as a more recent interpretation of that traditional detailing. Around doors and windows there was normally a timber architrave, about 75-100mm deep, masking the junction of door frame and wall. The usual way of detailing the architrave seems not to have taken account of local design traditions. This example shows a running semi-circular motif at the outside edge with a repeated triangular section in the centre of the architrave. On the face of it there seems to be no hint of the character of detailing to be seen either on the door or, more suprisingly, the ’enf of Qatari buildings. Compare this photograph with the those of ’enf above to see the difference. Here is another photograph showing a similar detail with the semi-circles having a small circular hole made in them, this time taken in Wakra in 1974. The detail here is simple in that it consists of only three patterns, but the rope detail particularly, has been well made with even distancing between the cuts although, again, there is no constant relationship between the semi-circles and triangular pattern. But the construction of the architrave seems to be typical of these design elements in having two of the design features – the triangular section and semi-circular motifs – worked out of the same piece of timber. Local practice would have this piece of timber as the element immediately in contact with the frame of the door and, usually, a piece of timber fashioned as a rope moulding covering the junction of the architrave element and the masonry finish. Note that the rope moulding has been fashioned by making a number of parallel saw cuts at around 45°. Similar to the detailing of the examples above and below is the treatment of this architrave. It is evident that the craftsmen who constructed these doors had a small number of details suited to running designs and from which to select for the doors they were installing. Elsewhere I have mentioned the expense of doors and it would be common practice to re-use doors in new constructions. Whether this applied to the architraves or not is difficult to ascertain, but the probability is that architraves would have been kept along with the doors and installed with them – assuming that there had been no damage to them rendering them, for instance, too short. While the above construction and detailing appears to be the most common method used, there was the possibility of variation. If you look at the various examples on this page, this took place in the proportions of the semi-circles and triangles, decoration of the semi-circles, creation of the rope moulding and other elements of the design. In addition, as can be seen in this example, additional timber elements could be added in order to enhance the three-dimensional character of the overall design. This photograph shows more of the same doorway as that above. This doorway was one of a number of good quality doorways belonging to merchants in the urban centre of Doha. The date of the door, 1353 AH, corresponds with 1934 AD, suggesting that this merchant was relatively successful by that time. However, this was a time when the economy was struggling with a number of factors, one of the chief ones being the influence of the Japanese artificial pearling industry on the local, natural pearl industry. The second photograph was taken in Doha in 1977 and shows a similar quality door of, I would guess, a similar date. Note that the sequence and relative balance of the three pattern types – rope moulding, triangular and semi-circles – are very similar, and that in both cases there is an additional detail above the door consisting of slatted elements with angled sides and carving which produces diamond shapes. This appears to be a standard way in which these doorways of the 1920s and 1930s were fabricated. The lowest of this group of three photographs shows detailing from another, good quality doorway in Doha’s central area, this time the date is given in the central lozenge as 1343 AH, corresponding with 1924 AD. Again the detailing is very similar to those above but, in this case, there is the addition of the over-sailing timber elements which have something of the character of the papyrus plant detailing mentioned elsewhere. It must have been an expensive detail to produce, and one which exposed the expensive horizontal timber to the elements. However, while having no apparent practical purpose, it creates an attractive canopy to the doorway, and would be capable of introducing strong shadows from a high sun. It is unclear to me why this may be so, but if you examine the above photographs, concentrating on the rope mouldings above the door, you will see that where they meet in the centre there is always a common V junction. From a design point of view this seems to be counter-intuitive, the two sections better visually joining in an inverted V junction. The apparent reason for it seems to relate to two factors. The first, obvious, one is that the corner junctions are more naturally joined when the central junction is a V joint. The other reason may be that, looking at the top of the door on the right – the natural way in which an Arabic eye would read it – the top right to bottom left slope replicates the natural slope of Arabic calligraphy. Compared with our understanding based on modern Western practice, the traditional doors of the region were traditionally locked from the outside, the family staying safe with the men away while being protected within the property. This practice was common into at least the middle of the twentieth century with the lock, bolt and central ’enf being major design features of the external doors of residential properties. This is not to say that there were not security features within the property. This photograph below, albeit of an old door near Riyadh in Saudi Arabia, illustrates an internal locking or bolt system designed to give a similar degree of security against anybody attempting to enter from outside, but omitting a miftah, or key. The external bolt, mazlaaj, for the door was a simple form derived from the ancient locks developed in Egypt, and contains the primitive hardwood lock or qifl. The key, miftah, was an angled piece of timber having at least three wood or iron nails in it which corresponded in length to wooden tumblers within the hasp which were designed to constrain the movable bolt. Where there were three pins they were arranged in a triangular shape rather than being in-line as shown in the illustration above. Inserting the key in the opening in the top of the bolt enabled the owner to lever the wooden tumblers upwards, so permitting the bolt to be slid backwards or forwards. The first of the adjacent two photographs shows the front of a door with the handle, lock and ’enf, the second photograph showing another door handle and bolt, though the bolt can be seen to be broken on its top right. These two photographs show, respectively, the front and back of two old mazaalij giving an indication of how these bolts were organised and constructed. Note that the mazlaaj at the front is slightly broken at the point of entry for the key. In the lower photograph it can be seen that the rear of the two mazaalij has a cut-out under the position for the pins; unseen in the photograph, the other has the cut-out in its base, both of them facilitating the making of holes to receive the locking pins. Both mazaalij have three holes to receive the drop-down locking pins, though not in the same arrangement. It is likely that this arrangement would have been preferred over an in-line arrangement as that would need to have a wider handle. Generally handles appear to be around 40mm wide, the top being cut out at the back so that the locking pins can be introduced prior to the handle being fixed to the door. The mid-twentieth century saw the introduction of steel and brass hasps and padlocks which did away with the need for the cumbersome traditional bolt and its large key. This modern form of bolt is known as a seekh and the bolt and padlock would have been used when metal became more affordable. From observation, many of the first padlocks appeared to have been brought in from China. Many of the doors to houses had a single handle securing, along with the ’enf, the mazlaaj. But the better quality doors usually had a pair of handles, one each side of the ’enf, at the same time providing a more symmetrical and, perhaps, more satisfying design solution. What is noticeable here is that the two handles are not positioned at similar distances from the ’enf in order to take account of the mazlaaj in its opened position, thus enabling the door to be swung open. Despite the intrinsic strength of the teak from which the door assembly generally, and the mazlaaj in particular were constructed, time and continual use created problems for this type of security system. In this photograph it appears to have been the ’enf which has deteriorated most rapidly, usually because a significant amount of the timber is cut out to accommodate the mazlaaj. Note that there has been considerable wear on the handles. The owner has cut the ’enf and this door system was then secured with a chain and padlock. Doors were constructed from thick teak vertical planks fixed from the outer face to three horizontal teak cross pieces. The fixing was effected with dome headed, wrought iron nails – mismaar hadeed, usually 150mm to 200mm long and two to each vertical plank, the ends bent over and hammered down to prevent their loosening. They are remarkably strong and I can confirm from experience how difficult they can be to dislodge. The combination of wrought iron and teak make an extremely coherent construction. Although I wrote that external doors were locked from the outside with what was, at the time, a relatively substantial and secure latch, there was often a latch or bolt on the inside of the door to provide a minimal amount of security. As you can see from this first photograph, these locks could be very simple in design though would have provided a certain degree of security from anybody attempting to force the door. Bear in mind that these doors are made of teak and have extremely strong wrought iron nails binding the timber elements together. The lower photograph was taken of a door in a village outside Riyadh, Saudi Arabia, and shows a slightly stronger bolt which operates with no locking element. Note the use of wrought iron nails twisted up to provide additional strength to the wood holding the bolt. As you can see from this photograph and the photograph accompanying the next paragraph, the ends of the wrought iron nails are bent over and hammered back against the ledge, a procedure that significantly strengthens the construction of the door. These wrought iron nails are incredibly tough and take a considerable effort to remove when there is access from the back of the door; they are almost impossible to removed from the front due to their dome-headed detailing. Their fabrication creates a very rough shank which adds to their strength in fixing timbers together as well as inhibiting their easy removal. The technique of turning their ends over isn’t new, in fact it is not common to just the Gulf or Arab world. The lower photograph is a detail of a seventeenth century door to a castle at Hay-on-Wye in England showing the same technique used to secure a hardwood door – most probably oak – to its supporting diagonal frame construction. As mentioned above, sometimes latches were provided on the inside of external doors in order to provide safety for residents. This photo was taken in the Doha wind tower building and is unusual in that the bolt is supported on a timber ledge rather than allowed to hang loose as was the usual practice. This is a much stronger locking device than that shown above and perhaps reflects a different degree of wealth or status. Although this door may be original, it looks to me to be in too good condition and it must be assumed that this is a later addition. Note that the wrought iron nails are long enough to be taken right through the timber and turned over on the inside. The other thing to note in this photo is that the internal side of the door appears to be finished with a varnish rather than being oiled as teak should be. Compare it in colour and texture with the door above. The reconstruction work in Qatar is producing a number of interesting works. This door illustrates many factors that can be found in these projects, both accurate and novel. These main doors are traditionally known as darwaazah and come with and without the smaller farkhat al bab, or wicket gate, in them. Although the door looks authentic it differs in many respects from traditional doors in Qatar. The running relief decoration doesn’t look as if it comes from Qatar, the decorated nail heads are unusual – they are usually made from hollow dome-headed wrought iron nails, baazur – the doors are hung on brass hinges rather than being fixed on pintle hinges as was always the case and, in the case of this door, there is a frame at the edge, unlike traditional doors. Hinging the doors in this way seems to expose them to easier attack whereas, with pintle hinges, the door is relatively safe from attack at the sides, the edges of the door being set behind the frame. In addition to this, doors of this size would usually have a farkhat al bab in them in order to reduce the need to open large doors. Having criticised the doors for their accuracy I have to admit I rather like them. Obviously it is difficult to make new doors exactly like old doors, but I think these doors would have benefited from a little more attention to traditional detailing. However, the doors do illustrate accurately the traditional qifl arrangement; as I’ve noted elsewhere, traditional doors are locked from the outside, the large wooden key being taken by the man of the house, the family remaining safely inside. It’s good to see that the old traditions continued for some time, not just with prestigious sets of doors as are illustrated above, but also with more normal doors as are illustrated in these next photographs. This first pair of large doors illustrates how the traditional timber security arrangement was taken over by the more secure provision of, in this case, two steel bolts secured through the ’enf. Note that there is some carving to the sides of the ’enf suggesting that it was old and has been re-used for this door arrangement. As illustrated above with an unusual double-bolt arrangement, these first attempts to strengthen doors used the existing ’enf with the addition of steel bolts secured to the face of the door with steel eyes. More usually this was accomplished with a single steel bolt, the first attempts being relatively crude, as illustrated here. The bolt appears to be unnecessarily long and, as there is no lock provided, it suggests the house was being lived in by expatriates. This simple form of bolt was found on many houses in the peninsula, but mainly Doha. This example of a door secured with a bolt through its ’enf was photographed in the Bastakia, Dubai in 1984. The carving of the ’enf and the design of the brass fixing plates are of a higher quality than usually found in Qatar, reflecting the more prosperous city of the twentieth century. Nevertheless, and despite the hole through the ’enf being at a relatively strong position, this arrangement incorporates a structural weakness. In this lower example, again photographed in the Bastakia, Dubai, but nine years previously, that weakness has been recognised and a steel tube inserted through the ’enf, into which a steel bolt can slide. However, there remains a weakness in cutting out the ’enf, depending upon how the tube is fixed to it. Many of the traditional doors were adapted as increasing wealth within the peninsula saw a need to safeguard not only families but the goods being stored within houses and commercial stores. These adaptations, generally aimed at improving security, tended to be crude with the new practical needs overriding any aesthetic value to be found in the entrances. These ad hocamendments often produced a patchwork of solutions such as those illustrated in this pair of doors where the door’s face has been patched to accommodate a more secure fixing for the retaining hasp of the new bolt. The owner of this house in Doha has gone to the trouble of adding a brass bolt and hasp – fastened with a Chinese padlock – and then adding a cylinder lock. The brass bolt arrangement was poorly organised, one of the retaining eyes being fixed under the ’enf which had to be broken in order to make space for it in its closed position. Evidently still in use as the paint has been stripped from the hasp, the bolt arrangement suggests containing trust in this type of fixing. Why the cylinder lock was added is not obvious. The panelled form of the door with its ’enf suggests it dates from the 1950s. This is another example of the owner of a property making alterations to the security of his front door in two stages. The first addition to the door, most probably made when it was installed, was the incorporation of a bolt passing through the ’enf. Usage has damaged both the ’enf and the left hand door leaf as well as the screws fixing the bolt hasp to the door. So the owner has added a relatively flimsy steel hasp to the ’enf, secured by the ubiquitous Chinese padlock. This next pair of large doors appear to be constructed of a timber other than teak, and are hung on strap hinges fixed to the outside of the door. This is not particularly safe as external straps are available to attack from the outside. But there is an ’enf to protect the junction of the doors, and the bolt replicates in its arrangement and relationship with the ’enf, the traditional wooden bolt on the prestigious door. Security is maintained with a modern padlock, a much safer system than the traditional system illustrated above. The weakness of the door lies both in the strap hinges as well as the strength of the ’enf, but the development of a traditional door in this way is to be commended. You will see that the mazlaaj on this door is very similar to that on the door above, both of them illustrating a cranked hasp on the bolt. This feature appears to have been created by the functional need to have the staple immediately adjacent to the ’enf as close as practicable to it for optimal security. Another possibility is that it may have been designed to allow the hasp to be mounted on the stronger timber of a door constructed with frame and panels, as is this, rather than in the traditional manner of the peninsula – of solid timber planks. The mazlaaj has been fabricated from the softer brass rather than steel, presumably so that it can be more easily decorated, and seems to bear a slight design relationship with traditional designs of the peninsula, though is most likely to have been imported. The third door is a more up-market version of the two above it with the bolt and its fixings appearing to be fabricated especially for this door. Not only is the door made from teak, it has been supplied with the traditional ’enf and, unusually, brass baazur. These are obviously used for effect as they are nowhere as strong as the traditional wrought iron baazur. The only design issue letting down the appearance of the door, apart from the modern padlock, is the lack of traditional decoration on the enf, an element that could be readily amended and one that is a very important feature of traditional doors. This pair of doors illustrates the character of new reconstruction work. The door is of teak with a regular group of patterned carvings on the panels of the doors, as well as architraves and a highly decorated ’enf. The misaamir appear to be of brass rather than in the traditional, and more secure, wrought iron. The interesting point to note is the one that now governs the design and incorporation of the qifl in the door. Traditionally, as illustrated above, the wooden mazlaaj was relatively insecure in today’s terms. The introduction of a seekh made of nahaas or hadeed certainly improved security, but introduced the issue that faces those who rehabilitate, reconstruct or build in a traditional style – the extent to which they should be guided by historical fact and, in this case, how far back they should go to find exemplars on which to base their new work. The probability is that most doors constructed today in traditional forms will take the seekh rather than a mazlaaj in order to provide the higher degree of security now required. But to the extent to which the modern padlock is now the correct interpretation is debatable. The examples of doors and their handles shown above all relate to traditional doors associated with buildings, mainly residential. This example is different in that it was found on a boat. Its interest lies in the shape of the maqbadth together with the character of the decoration to the ’enf and mazlaaj. Although the door shows some weathering, the elements attached to it appear to be relatively new but are carved in traditional patterns, the diagonally running sinusoidal pattern on the ’enf being more intricate than those usually found on traditional buildings, though more two-dimensional – compare it with these old examples above. The qifl appears to have been added for decorative purposes. In order to unlock it, the qifl needs to be drawn to the right, though there is no associated marking on the door as might be anticipated. The above maqaabadth, curved in front elevation, are certainly unusual and different from anything seen on traditional buildings. However, there is a similarity in that traditional maqaabadth are often dished in side elevation as can be seen in this old, worn example. It is also possible to see that the running, angled pattern on the old maqbadth is similar in character to that on the new one above. One notable feature is that the old maqaabadth are face fixed through the depth of the maqaabadth in order to create a secure fixing. The new maqaabadth have far less secure fixings located in extensions at their bases where they join the door. Security is obviously not as serious a concern as it was in the past. Nevertheless, these elements of the door are very attractive and represent an interesting, welcome and honest development of traditional door design. Before leaving the subject of doors, there is one more point I should make. This relates to something I’m sure I have seen in Qatar, but have no photograph to illustrate it. This photograph was taken in Yazd, Iran and illustrates an arrangement where there is only a single door to a house or property. The doors to such a house are likely to be provided with two different knockers designed to make distinctively different sounds. The purpose is to distinguish between male and female visitors to the house, ensuring that the appropriate male or female occupant would open the door in order to maintain proper social segregation. The pintle hinge is one of the main features of traditional Qatari doors and would have been in use over centuries in the peninsula, if not in the Gulf, for centuries. Unfortunately I seem not to have any photographs of pintle hinges in Qatar, but this photograph was taken in a small village just outside of Riyadh, Saudi Arabia and illustrates what the pintle hinge looks like in use at the top of a door – viewed from the outside – perhaps with a little wear to it as it seems to have dropped. detailed properly, it is a very secure solution to the operation of doors. The sketches below illustrate the basic concept of the pintle hinged door. Where metal was a luxury, and even good quality timber expensive, it was important to spend limited resources carefully. Perhaps the chief needs for those creating enclosures would be protection from the elements, and security, though not necessarily in that order. Bear in mind that the peninsula has a history of warring tribes and of piracy. The most important timber elements were front doors, which were preferably made from teak brought in from east Africa, together with mangrove poles for roofs. Smaller timber elements were used for windows and these elements were re-used from building to building rather than being provided new to suit new developments. Main doors were constructed of vertical teak planks held together by hollow, dome-headed wrought iron nails driven through, usually, four horizontal timbers on the inside of the door. Generally doors are constructed in a manner which stops them sagging from the weight of the timber. This is effected by using horizontal ledges and diagonal bracing to which the sheathing or vertical planking is fixed. In the case of Qatari doors there usually is no diagonal bracing, the structural integrity being gained solely through the rigidity gained through the use of wrought iron nails. At the edge of the door, next to the jamb, a strong vertical timber, longer than the height of the door is rounded at each end and let into both the ground and the head construction over the doorway. This is the pintle hinge. There is obviously some friction between the teak and the juss and stone construction, but this is amply countered by the heavy weight of the door. The weight of the door is taken by the pintle hinge bearing directly on the ground, which is an extremely effective way of dealing with the heavy construction. On the outside of the doorway there is a heavy timber frame, nearly always of teak, and usually carved with a running decorative motif. Although I have not shown it on this sketch, there is often a decorated piece of timber hiding the junction of the timber door frame with the rendered finish of the opening. This architrave is usually decorated with a running geometrical design. Nearly all the Qatari frames I’ve seen have three-dimensional geometric patterns carved into them rather than the more floral ones I’ve that might be seen elsewhere in the Gulf. In the accompanying upper sketch, made from the inside of the doorway, I have shown the external frame planted on the head of the door opening and, in the lower sketch a view of the manner in which the top of the pintle is set into a hole in the head of the doorway. Often on the jamb of the door, there is a reveal in the masonry construction to provide additional protective security to the edge of the door and its pintle hinge. The size of this rebate is governed to some extent by the stones used to make the walls, bearing in mind that the stones will be of irregular size and bonded with juss mortar. The manner in which doors are provided is interesting as, in opening inwards, they are not as capable of resisting frontal attack as would be an outward opening door. These doors rely on their heavy timbers and internal bars to produce security against this type of attack. I think I may have already mentioned it, but it will bear repeating here, but doors and windows tend to last longer than some of the buildings into which they are fixed and tend to be re-used as buildings develop or are built anew. As a consequence doors and windows can be considerably older than the buildings in which they are situated.